A powerful X1.8-class solar flare erupts from the sun on Dec. 19, 2014 in this view from NASA's Solar Dynamics Observatory spacecraft tracking sun weather. 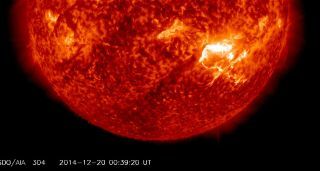 The sun fired off a massive solar flare late Friday (Dec. 19), after days of intense storms from our nearest star. This NASA image from the Solar Dynamics Observatory spacecraft shows the active sunspot regions currently visible on the surface of the sun. Active Region 2242 unleashed a huge X1.8-class solar flare on Dec. 19, 2014, one day after this image was recorded. "The region remains large and complex," SWPC experts wrote in the update. "More minor to moderate radio blackouts are expected, with an ongoing chance for another strong event." Friday's solar flare capped an active week of sun storms. Earlier in the week, another active sunspot region called AR 2241 fired off two intense M-class (moderate) flares, one late Tuesday (Dec. 16) registering as an M8.7-class sun storm, and the other on Thursday (Dec. 18) that ranked as an M6.9 solar flare. Sunspots are regions of intense magnetic field activity on the sun that can trigger solar flares.